First thing first: Today is Avitable’s birthday. Way back when, Hilly tricked me into believing that it was Adam’s Birthday when it wasn’t. But today I’m pretty sure it is Adam’s birthday. So go over there and wish Avitable the bestest birthday wishes ever. Doooooooooo it. Then come back and read the rest of this post. Please? And of course: Happy Birthday Adam! I’m considering moving the stove over about six inches to the right in order to accommodate this baby. My current espresso machine is about 3 inches narrower. That would require rebuilding the counter top, moving the upper and lower cabinets – nobody wants the stove not aligned with the range hood, right – and doing some electrical work. The alternative is to get a new house. Unless you see another option? Nothing makes me feel more like a second rate citizen then summer rolling around at my workplace. This is a map of the places to get food or coffee on campus from September to the end of April. Click to embiggify. This is a map of the food places where we used to be able to get food on campus, but now that the sutdents are gone for the summer can’t stay open for the 5,000 employees only. Click to embiggify. Red dots mean closed for the summer. Yellow dots mean reduced business hours for the summer (normally just open for lunch). Green dots mean open as usual. Please note that the north green dot is a Second Cup that’s not on campus. The south one is a pharmacy that sells plastic (wrapped) sandwiches and soft drinks. Anyways, every year it’s the same thing and regardless of the multiple food surveys we fill every semester asking for some kind of decent food service over the summer we’ll probably never get anything done about this because it’s a numbers game. 40,000 people (35,000 students + 5,000 employees) is a much bigger number than 5,000 employees. But I think the fact that those 5,000 employees are the ones who make the business go is easily dismissed when we start putting profit above people. How come summer hours for employees only start June 1st, but all the food places are closed for the summer starting May 1st? This is the fourth* in a series of posts in the Year of the Purge : A to Z. Every other Sunday, I’ll get rid of something starting with the letter A and working my way to the letter Z by the end of December. This week I’m tackling B. If you didn’t read the letter A, for my awesome t-shirt, or the letter B, for books you might enjoy them. *It’s the third really, but who’s counting. I tought I was going to get out of that one, but let’s face it: Spending 50$ a week for coffee is not the smartest thing I can do with my money. To make matters worst, the Starbucks on campus is not a corporate Starbucks, it’s a franchised (I believe it means sub-par) one, so their 6$ coffee often tastes worst than the 1.65$ coffee from Tim Horton’s. Thankfully, the delay allowed me to have one last Venti white mocha Americano huzzah with Suze from stillbaking.ca. The fact that she decided to stop bloggoin on that very same day is totally unrelated to me I swear. So I’m not saying I won’t ever drink coffee anymore. I’m just saying I’ll stop drinking the expensive stuff that tastes like crap. Noticed how I leave that door wiiiiiiide open? 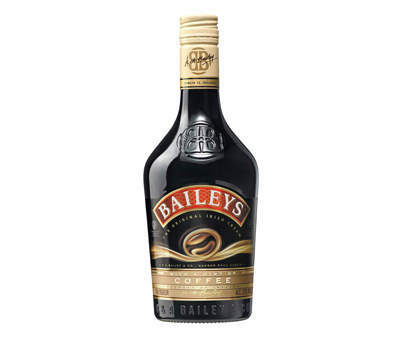 It’s Bailey’s with a HINT of coffee. How perfect is this product really? This is like the best thing since macaroni and cheese, except I could never have mac & cheese everyday at work without getting the questionning eye from my coworkers. I absolutely love it when products combine two of my favorite things in the world in one nifty little package. In this case: My love for drinking delicious alcohol and just spending the whole day in my underwear.